2015 Taste of the West Award winner! Deliciously delicate dark chocolate brownie, flavoured with natural Rose oil, studded with slivers of Flaked Almonds and topped with chunks of Almond and Pistachio. 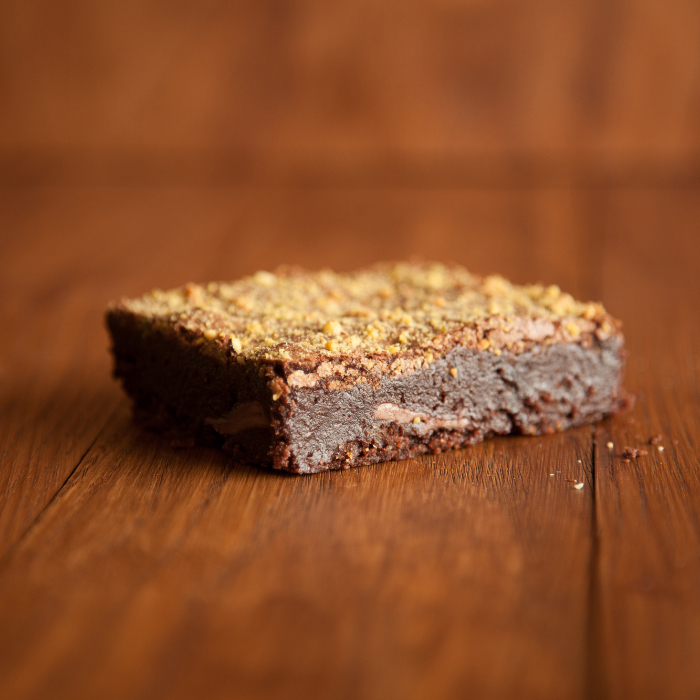 This staff favourite is free from wheat, gluten, dairy & eggs (but full of Awesome!). 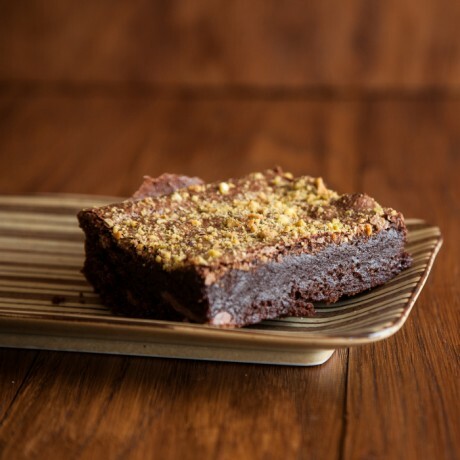 Made with decadent 70% Belgian dark chocolate, brown sugar and combined with quality ingredients, these brownies are rich and sumptuous and will leave you feeling satisfied and happy, without the the sugar hangover. All brownies are baked to order in small batches so you can be sure of the irresistible quality in every bite, but may take a little longer during busy periods (just drop us a message if you have any questions or need them for a particular date)Shelf life: Upon sending 5-7 days. Extend shelf life by refrigerating in airtight container. And Freezer Friendly! 72% Dark Chocolate Couveture [SOYA], Caster Sugar, Soya Milk [SOYA], Dove's Farm Organic Gluten Free Flour blend (Rice, Potato, Tapioca, Maize & Buckwheat), Rapeseed Oil, Egg Replacer (Potato Starch, Tapioca Starch, Raising Agent: Calcium Carbonate, Acidity Regulator: Citric Acid, Vegetable Gum (Stabiliser): Methylcellulose), Pistachios, Flaked Almonds, Bicarbonate of Soda, Cream of Tartar, Rose Water. These brownies are glorious and absolutely HUGE, even managed to put some in the freezer for later! The best brownies I've had since going vegan...and as good (if not better) than their non-vegan counterparts. Beautiful brownies and a lovely gift, thank you! I was sent a selection of these vegan brownies as a gift, and what a gift they were! I shared them at work, and the non-vegans couldn't believe how delicious they taste. Rich and chocolatey, they're definitely ones to savor, and the flavour choices were on point. Will definitely be ordering again. Very happy with brownies but wrong address was put on packing slip so went to incorrect address meaning it was a week late. Am glad they got there in the end though. This was a gift, so I can't yet comment on the taste! Bought the Queen of Sheba brownies and they were delicious! Bought the Queen of Sheba brownies and they were delicious! 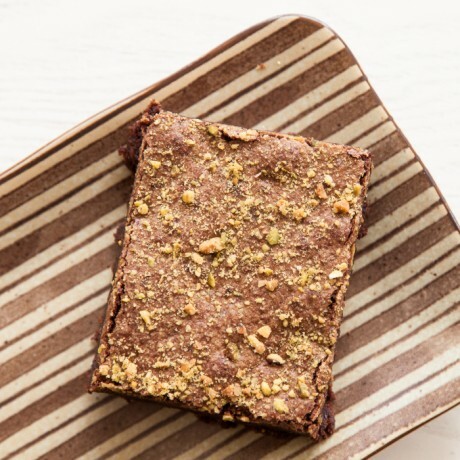 Dense and moist, very generous helping of pistachios and not too sweet - if there can be such a thing as a healthy brownie - then this is it! Would buy again!